Zhang Ming is Ambassador Extraordinary and Plenipotentiary and Head of Mission of the People’s Republic of China to the European Union. Last month, I had my first Chinese Spring Festival celebration in Brussels. It was unforgettable to see Chinese lanterns illuminating the Grand Place, the world’s most beautiful square as described by French writer Victor Hugo. It was exciting to see the Galeries Royales Saint-Hubert decorated with Chinese red lanterns, bringing a moment of happiness to my European friends. Again, I was fascinated by the perfect fusion of Chinese and European cultures. More than 700 years ago, The Travels of Marco Polo invoked Europeans’ curiosity of the East. Numerous trailblazers made strenuous efforts to connect Europe with Asia, and finally, opened up the ancient Silk Road. Today, China and Europe are bound together by faster transportation, closer commercial ties, and more diverse cultural exchanges. Despite its long history, the spirit of the ancient Silk Road, namely the respect for diversity and the pursuit of common prosperity, is still alive and relevant. Since it was launched over four years ago, the Belt and Road Initiative (BRI) has received wide support from more than 100 countries and international organizations, more than 80 of which have signed BRI agreements with China. The first Belt and Road Forum for International Cooperation held last year produced fruitful results, and contributed to a global consensus on Belt and Road cooperation. China and Europe, each located at one end of the Silk Road, are natural partners on the BRI. With the joint efforts of both sides, the BRI and Europe’s development strategies are creating synergy. Governments of 11 EU member states have signed BRI cooperation documents with the Chinese government. 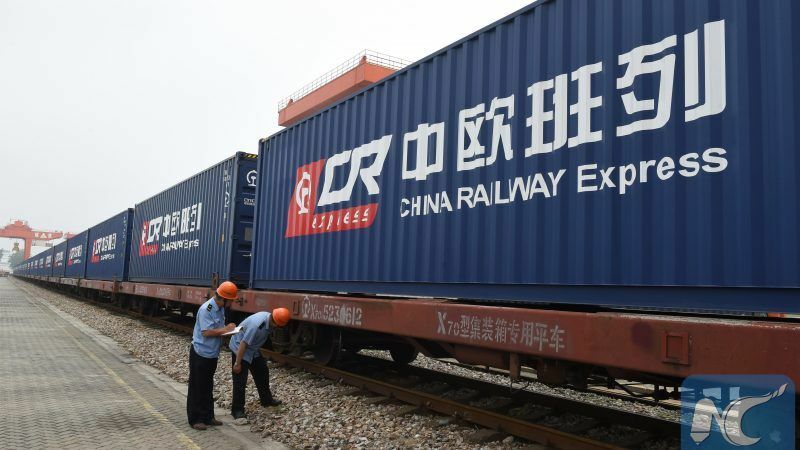 The China-Europe express freight trains are busy traveling across the Eurasian continent. In 2017, a total of 3,673 trips were made, up by 116% from 2016 and exceeding the total number combined during the past six years. The train services reach 36 European cities in 13 countries and make the access of European goods to the Chinese market much easier. In addition, a great number of projects are well underway, such as infrastructure, logistics, ports, e-commerce and finance. For instance, in Serbia, a Chinese enterprise bought a troubled steel mill and turned it around in less than a year. In Greece, the Port of Piraeus regained its position as one of the largest ports in Europe. In the United Kingdom, China is partnering with France to build a nuclear power plant, a stellar example of tripartite cooperation under the BRI. The Brussels-based economic think tank Bruegel estimates that the EU’s foreign trade will increase by 6% because of the BRI. The BRI, as a brand new initiative, enjoys huge potential. Yet, its potential will be brought to full only when all players come to realize its importance and take part in it. To help you better understand this initiative, I would like to characterize it with three words. First, openness. The BRI aims to promote economic cooperation through infrastructure connectivity and to bring about common development by leveraging the comparative strengths of all participants. As a global public good, the BRI follows the golden rule of extensive consultation, joint contribution and shared benefits. All parties get involved and gain benefits on an equal footing. The BRI is definitely not a unilateral strategy or China’s Marshall Plan, as some have called it. On the contrary, it is designed to promote cooperation that is open to all. Second, transparency. The BRI is not a one-way street allowing only China to export its resources, market opportunities, technologies, projects, and manpower. Rather, it is based on wide consultation and communication. Our goal is not only to strengthen the physical connectivity of infrastructure but also to improve the institutional connectivity of rules and standards. All BRI projects have to go through well-informed feasibility studies conducted by interested parties and must follow market principles and international rules. All projects must be results-oriented, high-standard and sustainable. Third, inclusiveness. The BRI aims to establish a regional economic cooperation platform that is inclusive, balanced and beneficial to all. It is not meant to reinvent the wheel. Rather, it seeks to complement the existing bilateral and regional cooperation mechanisms. As people say in Europe, “Rome wasn’t built in a day”. The BRI is such a great undertaking that it has to involve many participants, including those from Europe. While each participant comes from different backgrounds and has different needs, we respect such diversity and value flexibility in our cooperation instead of insisting on uniformity. In our world today, protectionism and isolationism are still taking a toll. China, with its 40 years of reform and opening-up, has made its stance clear: openness brings progress, while self-seclusion leaves one behind. We remain committed to partnering with our European friends in an open spirit. Let’s consult, contribute and share together to make a success of the Belt and Road Initiative. Reform in China – this is about giving indefinite power to one guy, as voted few weeks ago? Is it really a good idea to connect too much with a country, which may become a dictatorship? A nationalist socialist dictatorship? Sounds familiar? Yes, this is great project to work on with Europe but China cannot be so altruistic. It must also be benefitting from it. Who will benefit most? China or those along route? China is in a position to throw its money along the route. But it also creates indebtedness along the route. Will it be a level-playing field and to what extent? Won’t China have the upper hand rather? Who pays, funds, calls the cards. Indebtedness to China will also mean under China’s political influence. Europe may be in a position to resist Chinese influence but not disadvantaged countries along the way. Think of S.E. Asia. Think of Pakistan. European countries may be able to resist Chinese influence but we shall see to what extent Central and Eastern Europe can resist China. They could be the route to influence EU policies. I may appear in this writing to be negative but there always two sides to every coin, the beautiful side as in the Ambassador’s article but it does not say anything negative. One cannot if one is selling the Belt and Road initiative. What will China benefit? Middle Kingdom becomes a global kingdom? Perhaps a revenge of China being humiliated by European colonialists. Now, it is China’s day as hegemon at least economically by buying up European companies and penetrate further European economies and become more dependent on China. Sorry for such a potential scenario. I am trying to find out the real Chinese intentions as there are always two sides to every coin.